FAQs - Curricula : Covenant Home Curriculum - Providers of a complete, eclectic, classical approach, Pre-school through 12th grade curriculum for home educators with a reformed Christian world view., The World's Best Reformed, Comprehensive, Classical, Homeschool Curriculum, and School Administration Provider! How does CHC compare to Calvert? Isn't a full, classical curriculum harder to use, in addition to costing more? What is meant by "Reformed" Christian? What does the name Covenant mean? What makes Covenant Home distinctive? May we start the next grade before finishing the last? What is Covenant Home's statement on certification? Our curriculum has sometimes been compared to Calvert in a favorable light. This is because of our wide use of good classical literature, our special emphasis on grammar skills and etymology and the overall depth of our academic programs. Here the comparison is favorable enough. There are important differences, however, that should also be carefully noted. Covenant Home provides a thoroughly academic Kindergarten curriculum. This includes the first phase of a four-year phonics program that enables the student to read at a high level before he enters first grade and ensures the ability to decode and understand new words. Calvert, by comparison, has only recently reintroduced a phonics program in Kindergarten, while their ongoing reading instruction only has a "phonics emphasis." Their reading materials require the student to learn a group of "sight words" in order to read each assignment. Calvert’s approach to language is pretty much a "whole language" one with phonics as one aspect of the program. Covenant Home presents science from a thoroughgoing biblical, Creationist perspective. We presuppose the revelation given to us in Genesis 1 and 2 and draw attention to God’s glory in creating all things by the Word of His power. Calvert presents science from a Humanistic, evolutionary standpoint. Covenant Home books and materials become the property of the family. They can be reused with as many children as the family desires. Replacement packages are available for grades K through 8 and we work with our high school enrollees as closely as possible to tailor and supplement their programs, as well as to help save money. On this matter Calvert requires the family to sign a use agreement. Teacher’s guides must be sent back. Only one student may use each curriculum. Covenant Home offers a complete curriculum in grades K through 12. Also, transcripts and diplomas are available through our Grade Auditing service. We have over the years had many a Calvert family join the Covenant Home family in Ninth grade since the Calvert curriculum is only carried in grades K through 8. There are other differences, but these are a few of the most important ones. We think they constitute some of the most significant factors in making a curriculum choice for your children. We don’t mind being compared to an old, established and well-respected program. We do want to emphasize the importance of the differences and to be sure they are noted. A student must be enrolled in the full Covenant Home Curriculum and in the optional grade auditing service in order to earn a diploma and receive transcripts. Before a diploma is issued the following requirements must be met and documented. Grade auditing is an optional service. In high school it is necessary, however, if you wish to receive transcripts. Real accreditation is in terms of acceptance at all colleges and universities. It has to do also with "strength of curriculum" -- this means the depth and thoroughness of the program. Our diplomas and high school transcripts are accepted at all colleges and universities. SAT/ACT scores, combined with a properly drawn high school transcript are the keys to college acceptance. Please see our Statement on Certification found later in the list of FAQs. Q. Why does Covenant Home Curriculum cost a little more? A. Because it has that extra biblical dimension and academic depth that provides staying power for your children. Q. Is Covenant Home harder to use? A. Some ideas can’t be taught by "filling in blanks" and taking "true/false" tests. Covenant does require more nurture and follow up by parents. Answer keys and study guides are provided, but that further input of loving discussion is also needed. The new-born coos and chortles about God’s wonderful grace and peace. A banging screen door and the toothy grins of childhood confirm hopeful prospects of a rich heritage, but teen and college years too often become a stinging disappointment to good and godly parents. Happy young people having left to earn a degree return home with a faith deathly chilled by unbelieving professors and the carping tone of the university. Some of them come home with hearts soured and attitudes to match. The drugs of self righteousness and a questioning temper have been fed with damning constancy. That awful slide must be stopped. Young minds will question and probe. It is God’s design to instill the spirit of challenge and a curiosity of fascination that fuels growth. At one time these same children accepted answers from mom; the generic, ". . . because God made it that way." The authority of parents was enough. Eventually they went away and encountered new authorities that said it wasn’t "that way" at all. Covenant children should be given more. Even from the first day of kindergarten, when the foundation is established, minds must be engaged with the fullness of the whole counsel of God. Covenant Home Curriculum has been designed to instill a strong Christian world view in a child, one that will prepare him for any philosophical attack or Humanistic lure. A reformed world view is always built around the wonderful sovereignty of God. His perfect sovereignty is applied to creation, history and, theologically, to the way of salvation itself. Learning to recognize that great truth and its application to all of life goes far to make the Christian child able to rightly defend the Faith and to be fortified against the sophisticated aggression of cynicism and unbelief. Covenant Home Curriculum costs a little more and requires a bit more work than many of the others. It is tougher than the fill-in-the-blank programs that abound in the market place. Like the legendary US Marines, it enrolls only a "few good men" but, you and your children can be among the best of them. Some say that Covenant Home takes more time too, but after making the effort of fully using the manuals, history overlays, study guides and test sets provided with our texts, you can expect to establish a deeper foundation for faith and thought as the result. This better foundation will support a much better "building", one that will last through the philosophical and theological tempest that even now swirls on all of our horizons. It will be a life’s structure that will bring more honor to Christ. All of God’s people love their children and want the best for them. Everyone looks for good character, obedience and productivity in their little ones. We are saying that even more than this is necessary in the sinful world into which they will soon venture. More means grounding in the deeper application of biblical principle as it touches on economics, history, politics, worship and a host of other subjects for which the enemies of Christ shout their loud and wicked speculation. First: Our grade auditing service means that a specific person is assigned to your family. You will be given her contact information and she will be available for questions from time to time. Second: A check-off list will be sent to you - these are items which you are to submit to your auditor each quarter. Your auditor will review the student's work, as well as the grading you've done, and issue a report card. The auditor's comments on written work are of particular value to families. Third: Your high school auditor will maintain a transcript of both academic and extra-curricular work, standardized test scores, and other pertinent information. Fourth: Having someone beyond mom and dad provides an objective observer of the work and can also help children with procrastination. It means that our Christian world view and our whole theology is in line with the great writers of the Reformation. (Men such as Luther, Knox and Calvin and the writers of the Westminster Confession of Faith) Reformed Christians believe in the Sovereignty of God over  Creation,  History and  Man's salvation. God created everything and He rules all men and nations for all time according to His own will for the revealing of His glory. We can have absolute confidence because everything is in God's hands. For salvation we must repent of our sin and call upon Jesus Christ for His forgiveness. It means that man is completely dependent on God for grace, God alone is the author of salvation. Tailoring sometimes has to do with students who are significantly ahead or behind in several subjects. We then are able to tailor a curriculum that specifically fits their needs. Tailoring also applies to the choice of an alternate subject such as Saxon math in grades 4-7, or Bob Jones science where Apologia is the norm. Generally speaking, if you decide to "tailor" more than one subject, it is usually more economical to purchase by subject module, rather than full curriculum. Covenant means the initiating action of our sovereign God. He has ordained and established each covenant home, each family that is grounded in Christ. He has given the child that providentially is a part of that home. The covering and protection of the Lord is upon the members and endeavors of the covenant family in their striving to fulfill their responsibilities and meet their holy stewardship. A Home that has been ordained and established by God is meant to resemble a tiny foretaste of heaven. When hearts are submitted to Christ and minds are fascinated by His Word there is bound to be hope and joy in the mix. Discipline also is necessary to rightly reflect God's love and good order. The Curriculum that most plainly builds on these ideas will benefit the diligent covenant family. 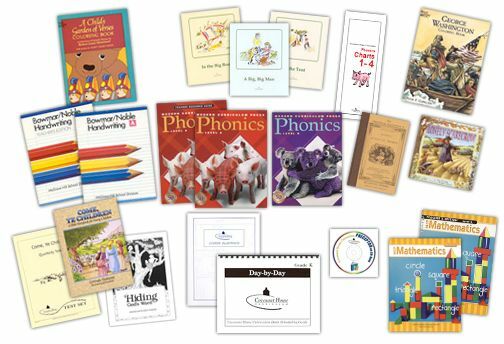 Using the "Classical Approach" to education, this full-orbed program begins by laying a thorough foundation in phonics, reading, math basics, history and science principles. Bible is taught from a covenantal standpoint, the Westminster Shorter Catechism is offered, as well as, excellent study guides that help to present a deep and discerning grasp of God's truth. The curriculum promotes the reading and study of the great literary works, etymology, Latin and other constituents of classical study. Finally, the ability to competently communicate soundly-based ideas is encouraged. Five important distinctives help to set Covenant Home Curriculum apart. In a crowded field CHC stands by itself as the leading choice, the preferred eclectic program for Reformed Christians. Establishing a sound foundation in phonics, grammar rules, math facts and other basics during the elementary years is of utmost importance in giving a student the basis upon which to build. This means a fair emphasis on deductive learning at the start. Later more advanced aspects of the classical approach are introduced, some expansion into inductive methodology, Latin and etymology, encouragement in critical thinking in the light of Scripture, effective argument and inquiry, investigation and the effective communication of ideas. Classical education also means the extensive use of proven literature, books that have mastered the test of time because they set forth eternal principles and substantial themes. It involves consideration of all the arts and how they connect with all of life. Some children are not learning every subject on level. This is a fact of life. Many are behind in reading or math. Quite a few never were taught the principles of phonics or grammar. Inductive methodology, used too early, has often gotten children off to a shaky academic start. Conversely, a few learn so quickly that we can scarcely keep up with them. They usually aren’t ahead in every subject, but often present more of a complication than the weak student. Covenant Home will tailor a curriculum to fit the specific needs of your child. Scholastic strengths will be encouraged and tested, while weaknesses will be understood and improved.Data for this procedure is obtained through counsel with you, the parent, and by use of our C.H.A.T. Diagnostic Testing Program. Knowing that quiz and test writing is one of the most demanding aspects of homeschooling we have provided complete test sets along with almost all curriculum subjects and levels. Ready-to-use test forms may be simply torn off their pads and handed to the student. Complete answer keys come with each pad of tests. Of course, parents can make their own adjustments, they may add to or take away from the test sets as they see fit. Available to those who select it is a staff of the finest teachers and academic advisors in the field. Personal counsel, encouragement and important feedback is the meat of this part of the program. In the high school years this service is most important because it enables CHC, as an umbrella school, to issue grade transcripts and diplomas when it is appropriate. Auditing has other benefits that are often very much appreciated by busy parents. The need to send in grading materials every 9 weeks helps to put the brakes on one of the occupational hazards of homeschooling, procrastination! Parents can augment their "clout" with outside help from the family contact at Covenant Home. This is the best and most weighty of the five strengths of Covenant Home Curriculum. Not as subtle as many Christians would think, the way in which we and our children look at history, the future, the arts and truth in general, affects our whole being. Does the world belong to Satan? Is God only doing the "best He can" in running history? How are Christians able to have a significant effect in the world, in their jobs? What is God intending to accomplish in history? Is He like a fireman trying to put out everything that is ablaze, or is He truly a "Consuming Fire?" If God is sovereign, how are we to account for evil things that happen? Does His sovereignty have holes in it? Will the Church, Christ’s Bride, turn out to be largely a failure in history? How can Algebra 1 help me in my job; how can it help me be a better person? Additional features that stand out in the Covenant Home program shout to be mentioned. These include the importance of using a high quality eclectic curriculum, the eminently helpful Day-by-Day planners and our faithful, covenantal view of the family. This aspect of curriculum is seen most easily by considering the superior strength of plywood. Strands from different sources layered together with powerful adhesives make for greater soundness. In a similar way the combined influences of many, filtered carefully by the biblical standard, present the most interesting and challenging educational model. Covenant’s balance and textual choices have been copied by many and will work effectively for your children. The broad base of this well constructed eclectic program delivers the most for your educational dollar. Another benefit is revealed by the fact that the highest percentage of children respond strongly to a classical, eclectic strategy. Its design enables most average students, even many poor students to do admirably, while still maintaining proper challenge for those atop the academic ladder. A special feature of Covenant Home is our popular daily planner. Every book for every course is scheduled in the Day-by Day. With this tool the parent has the entire year mapped out. Assignments, quiz and test dates, teaching aids and other information are listed on a 36-week register. Of course, if parents want to go faster or slow down, they can easily jot in the changes they wish. There is a separate planner for each grade level. God has instituted the family to bear responsibility for education. This means that the state has no jurisdiction in this sphere. Even the Church should only act in an advisory roll. CHC provides expertise and encouragement to conscientious, Christian families who want to carry out their holy obligation in the most discerning way possible. The CHC staff does not dictate policy. Rather, it publishes high standards and tries to help parents maintain order and productivity in the process. If you are not using our auditing services, you may begin and end your school year at any time. If you are using grade auditing, your school year must be complete before beginning the next year's work. This is especially important for high school students. Grades must be turned in and transcripts updated before we ship the next grade level. Students who have persevered in a controlled, challenging academic program such as Covenant Home Curriculum, have learned to work diligently and are more likely to be well prepared for successful college performance. Our academic board has deemed it not appropriate to seek certification by ordinary state agencies or like associations. This is primarily because civil government cannot be a guarantor of educational quality. This is manifestly true in our country today. Valid and reliable certification rests in several categories which might be summarized under the heading: strength of curriculum. All Covenant Home programs employ challenging text books, engage the student in outlining and note-taking skills, regularly scheduled tests that call for essay answers, instruction in composition, reading and analysis of classical literature, all supervised under a rigorous grade auditing service. Certification also finds its potency in the positive and long term acceptance of the Covenant Home program and transcripts at all colleges and universities throughout our country. The able staff of our tutorial program superintends the student’s work and academic progress and produces a written profile each nine-week grading period. Grade reports are issued every nine weeks and transcripts when appropriate. For those not acquainted with the increasing breadth of the homeschooling movement it should be noted that many colleges and universities are now sponsoring recruitment booths and other enrollment efforts at homeschooling curriculum and book fairs. Students who have persevered in a controlled, challenging academic program such as Covenant Home Curriculum, have learned to work diligently and are more likely to be well prepared for successful college performance.